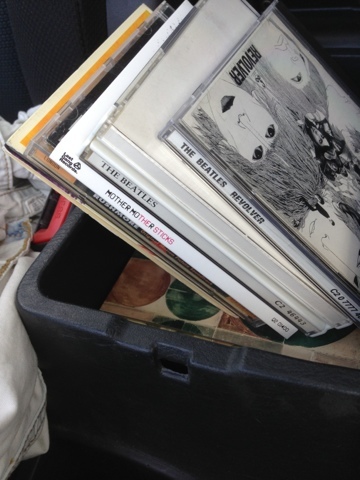 A few months back, Barbara and I decided that it would be cool to have CDs in our car. Remember those? We got a few from a friend and a couple more from a garage sale. They are themselves an activity. And I'm not talking about having a CD case in there. I'm talking about having a stack of CDs in their original cases piled neatly between the seats. We choose one, click it out of its little clasp, and the player munches it up. Barbara grabs the case, flips it over and reads off track #8. The boys in the back get to contribute. "Dad, is this rock and roll?" "No, Miles. This one is Jazz." "It's got soft drums and a lot of horns. Not too much singing." The best part about the whole thing is that the player doesn't work very well. It grabs the disk and spins with it continuously. The only way to get it to break out of its funk is to slam your hand on the dash overtop of it. Amazing, right? Just like Biff Tannon back in the 50's. Slam it once or twice and you've got tunes! In conclusion, I am promoting this practice.